"For nearly 60 years Fred Lawson drew aspects of life in the Yorkshire Dales for love rather than money. His huge output is now a social archive - and increasingly valuable. Even a small album of his pictures has become an exhibition. It could be said that what LS Lowry did for Lancashire mill towns, Fred Lawson did for Yorkshire market towns and the Dales. Their art reflected very different territory - Lowry's industrial landscapes are crowded with humanity, whereas Lawson repeatedly caught the solitude of country life - but in the undefined figures of both is the story of a vanished England. Many of Lowry's mills and factories have made way for shopping malls or apartments. Likewise, would Lawson recognise today's rural byways without hawkers' caravans, drovers, a traction engine at threshing time, or horse-drawn carts buckling under their cargo of wool? 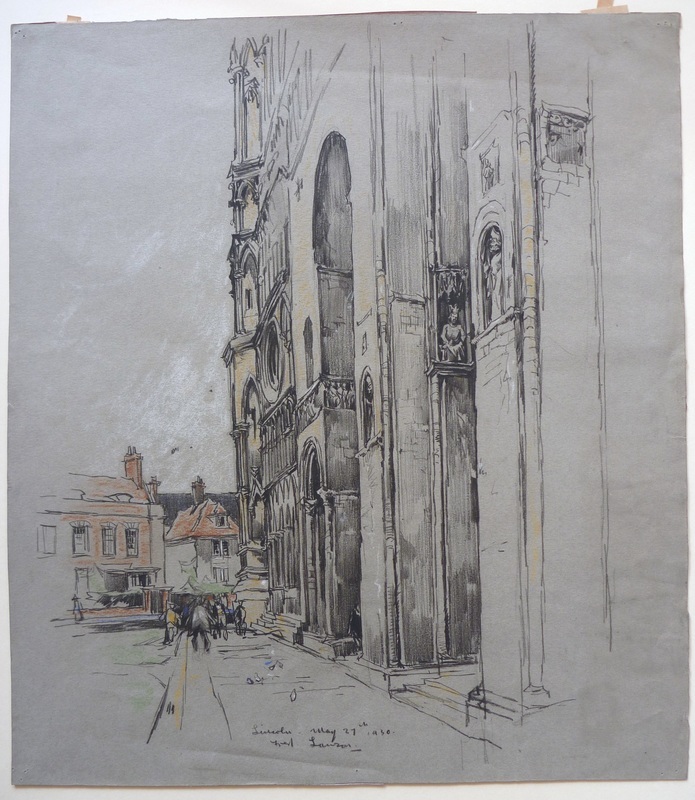 These were familiar scenes during much of the six decades he was drawing and painting in North Yorkshire. Nearly 40 years after his death, any number of people have a practical reason to be grateful for his deceptively simple social commentary. The art world has caught on to Lawson's value, and prices for his work are escalating. Fred would probably have been amused and surprised. They say he was a man with little care for money. His surroundings, and events within them, were his main currency. He was so prolific that when strapped for cash it was not unusual for him to pay his grocery or milk bill with a picture. Umpteen households in the Dales are said to have at least one Lawson on their walls, and how many are waiting to be rediscovered in drawers and cupboards? Other people were acquainted with him through his contributions to The Dalesman magazine, and some wrongly assumed he was a dalesman himself. He was born in Yeadon in 1888, studied at art schools in Dewsbury and Leeds, and then the Royal College of Art in London. A holiday in Wensleydale in 1910 was the turning point in his life and led to him and his friend, George Graham, establishing a studio at Castle Bolton. Though the Dales became his home and the inspiration for Fred's art - he, in turn, inspired an artists' group there - he wasn't confined by the area's routines and expectations. He sought out art on the Continent and in France he was influenced by the Impressionists and Post-Impressionists."